The Softail Deuce is well on its way to becoming a motorcycle classic - and these leather bags will help complete the journey. Styled to match the Deuce with chrome buckles, top-grain cowhide and a sleek "Deuce" logo, these bags feature an ingenious mounting mechanism that eliminates all visible hardware. 90404-00 Fits '00-later FXSTD models. Required for the Deuce Bags, this mounting system eliminates all visible hardware, allowing you to profile down the highway in style. 68360-00 Fits '00-later FXSTD models. Required to install Softail Deuce Saddlebags P/N 90404-00 and 92018-03. Also requires separate purchase of Directional Relocation Kit P/N 90395-00 for installation. These saddlebags offer a premium leather look with an extra-durable construction. The blow-moulded core keeps the bag rigid and prevents sagging, while the unique lids open outward for added flair. Bags feature locks for additional security. 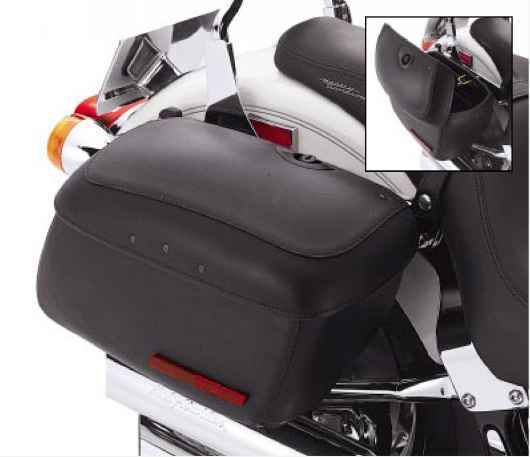 NOTE: Installation of these saddlebags with the following seats requires the use of Spacer Kit P/N 90976-01A: seats with rider backrests, double bucket seats, diamondback seats, stock FLSTF seat, stock FLSTC seat, and any other seats that contact the lid of the saddlebag. Spacer Kit not required if mounting with Harley-Davidson detachable Sissy Bar Sideplates. 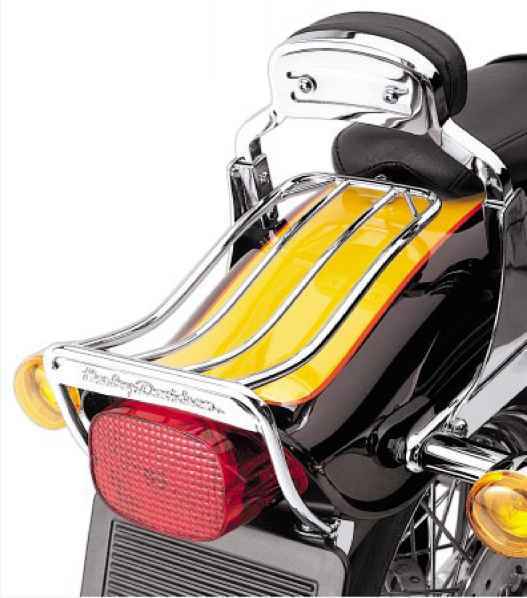 Directional Relocation Kit (not shown) Provides clearance for various Harley-Davidson leather saddlebags and/or luggage racks. 53692-96 Fits '84-'99 FXST, FXSTC, FXSTS, FLSTF and FXSTSB. Required in order to mount Sissy Bar docking hardware on all '84-'99 FXSTSB, FXSTS, FXST, FXSTC and FLSTF models.